As a sixteen-year-old playing for the Aspley Hornets, Andrew Adair he made the switch to umpiring, a choice that now looks like a wise one considering his meteoric rise through the umpiring ranks. After doing his time in the QAFL last year, 21-year-old Adair was quickly identified as a talent and given opportunity umpire at NEAFL level in 2017, resulting in his selection as a field umpire in the upcoming 2018 AFLW season. “I think it’s probably equal part nerves and excitement, it’ll be awesome to be on that stage and I think the TV exposure is a pretty cool thing as well,” said Adair. The umpire passionately followed the inaugural season and is keenly looking forward to seeing the progress of the AFLW as it goes around again. “Especially for guys like me who really love their footy, it was awesome to get to February and not have to wait till the AFL season started,” he said. 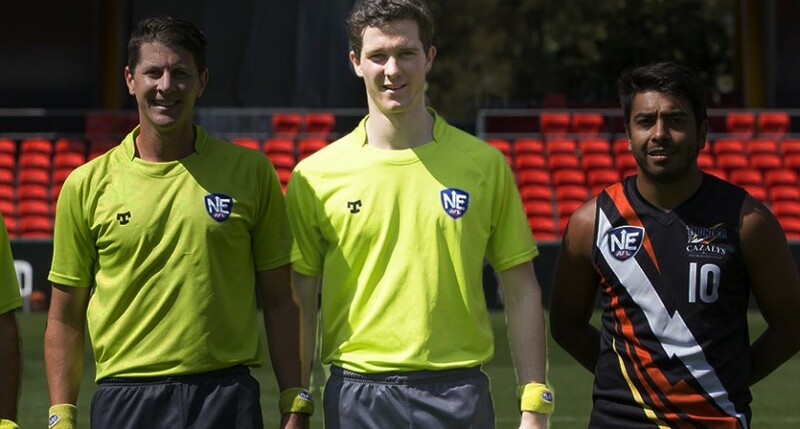 Despite being selected as an emergency umpire for the NEAFL Grand Final, Adair enjoyed the experience and was ecstatic to be able to umpire a number of NEAFL finals. It’s another positive step in the Business and Commerce student’s development, as he pushes towards his ultimate goal of becoming an umpire at the highest level. “You’ve literally got to take it week by week, just because you’ve got so many guys around you that all want to get to the same place all around Australia,“ he said. As the AFLW approaches, training is now ramping up and Adair is clocking around fifty kilometers of running every week, plus cross training. Along with the extra skill oriented training he does, it’s all geared towards the ultimate goal of achieving consistency as an umpire. “You’ll find that the best umpires, whether it be at NEAFL level or at AFL level, are just consistent week in week out,” he said. It’s perhaps an aspect of the AFLW that’s gone unnoticed, the elite opportunity it affords not only the players, but the coaches, umpires, support staff and media personnel. Along with the host of success stories within the Brisbane Lions AFLW team, this is yet another example of a Brisbane born local sports talent, making major waves in the AFL system.